TIf you've got a little girl who love to ask endless questions, endless questions, then My Friend Cayla isn't just an ideal present, it could be a sanity saver! My Friend Cayla can answer all your child's questions, from what her favourite colour is to what the weather is going to be like today. Ask Cayla questions to discover more about her! To activate, simply download the app, connect via Bluetooth and chat away! When connected to the 'net, Cayla has a lot to chat about, and she can help with homework like maths, spelling and general knowledge on subject such as geography. If not connected to the internet, Cayla can play games such as noughts and crosses, tell your child stories, and even have a chat about photos in her own special photo album (now that is clever). 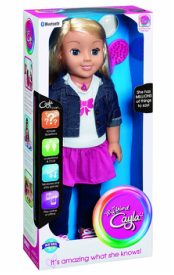 To use Cayla's interactive functions, she must be connected to a smart device via Bluetooth wireless technology, and that device must be connected to the internet, ideally via wi-fi, so Cayla can answer general knowledge questions or give current information. As you'd expect, the speed of Cayla's responses does depend on the speed of the WiFi connection, although at a push she can also work with 3G or 4G. Setting up Cayla is easy; simply download her free app to your phone or tablet, and Cayla will instantly have access to 3,000 questions - that's 50 hours of chat - and you can download more questions as required. Just open the app, pair Cayla to your device, and she's ready to delight, entertain and educate! My Friend Cayla has four levels of safety features built in. Cayla uses a bespoke software system called Violet, which automatically checks for any offensive or sensitive words against a pre-set blocked word list. If the question or answer contains any words on that list, Cayla simply tells your child she cannot talk about those things. As an additional check, online safe-search filters will scan Cayla's answers for inappropriate content. The app will not show website links, images, movies etc, and no personal information is stored by the system. You can add your own words or phrases to the blocked list via the app, and once a word is added, this cannot be undone as you cannot view the list.